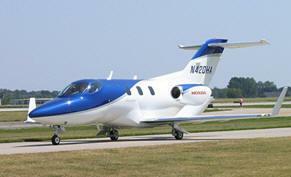 January 3, 2011 - Honda Aircraft Company announced that it has successfully completed the first flight of its FAA-conforming HondaJet advanced light business jet. The event is a significant step in Honda's aerospace program leading to delivery of aircraft in 2012. The first conforming HondaJet lifted off, December 20, 2010, at 15:31 EST from Honda Aircraft Company's world headquarters facility at the Piedmont Triad International Airport in Greensboro, North Carolina. The HondaJet remained aloft for 51 minutes, during which time the aircraft's flight characteristics and performance were analyzed and systems checks were conducted. Various test data gathered during the flight were transmitted real-time to Honda's flight test telemetry operations base within the company's world headquarters facility. "This is a very important milestone for the HondaJet program," said Michimasa Fujino, Honda Aircraft Company President and CEO. "This aircraft was assembled and tested under strict FAA certification processes, and we are very pleased to have achieved this successful first flight. Our team has worked extremely hard to reach this critical step in the HondaJet program, and these results reflect Honda's focus and determination to develop a class-leading aircraft." To support the company's certification program, Honda has completed its second FAA-conforming aircraft, which already has undergone numerous structural tests required for commencement of certification flight testing. Honda also has completed mating of main assemblies for its third FAA-conforming aircraft, which is now in the systems installation phase of completion. This third conforming aircraft, to be used mainly for mechanical systems flight testing, is scheduled to be completed in early 2011. A total of five FAA-conforming aircraft, including one additional flight test aircraft and one additional structural test aircraft, are planned to support the HondaJet certification program. The production HondaJet flight deck features a Honda-customized Garmin? G3000 next-generation all-glass avionics system incorporating a class-leading layout with three 14-inch landscape-format displays and dual touch-screen controllers for overall avionics control and flight plan entries. The HondaJet Avionics Suite is the most advanced glass flight deck available in any light business jet and provides state-of-the-art integrated avionics functionality featuring split screen MFD capability, satellite weather, graphical synoptics, digital audio, and optional Synthetic Vision.